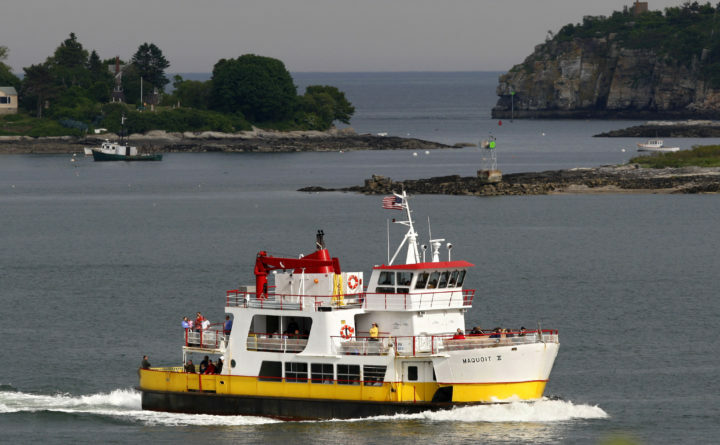 A Casco Bay Lines ferry leaves Peaks Island on its way to Portland, June 7, 2009. More than 20 people who live on Peaks Island in Casco Bay received a message Thursday afternoon, saying their parking spots at Ocean Gateway Garage had been taken away and to remove their vehicle from the garage by Monday. Lauren Webster said Ocean Gateway Garage is a short ferry ride from her home on Peaks Island. She said Unified Parking Partners, the managing company for the garage, told island residents they must now park at the Chestnut Street Garage or Monument Square Garage. Both are about a one-mile walk from the Casco Bay Lines terminal. “We pay $135 … for now a 20 minute walk both ways to get to the vehicle,” Webster said. Webster said she and her partner will make do, but called it disrespectful to expect island residents who have mobility issues or children to take on the 20-minute walk to other garages. Webster said she would have appreciated a month’s notice. She said she is hoping someone will take ownership for the issue.